Queue encodings in the ffmpegX Progress window. Includes a full-featured universal video player (mplayer) supporting VOB and text subtitles, with choice of fonts, font sizes and international text encodings including Japanese, Chinese, Russian, Greek and more. Includes a subtitle converter with OCR from VOB image format to SRT text format. Includes a bitrate calculator to control best image quality and target filesize. Includes an automatic crop tool. Includes a series of video tools like split, join, fix, mux, demux. Compresses a non-encrypted DVD to 4GB without reencoding it. Creates DVD image files from VIDEO_TS folders. Converts SRT subtitles to DVD Studio Pro 1.5 format. 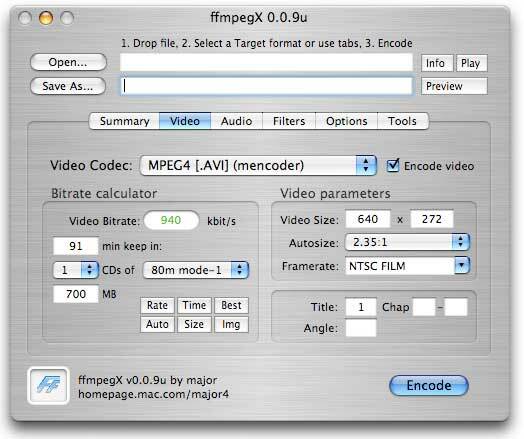 Creates AVI or MPG files with two audio tracks. Authors as VCD or K/XVCD (.bin/.cue files for burning with Toast by dropping the .bin into VCD window). Authors as SVCD, CVD or K/XSVCD (two .img files to be burned in Toast under Multitrack XA window). Authors as DVD (/DVD/ folder for burning in Toast DVD mode, and .img file for burning in Disk Image app or Toast disk image mode).